05 200 Merc 3.0 L 26 Merc prop, 10" Rite Hite jackplate, Garmin electronics, Motorguide Tour 82#. Propshaft is 1" below the pad. 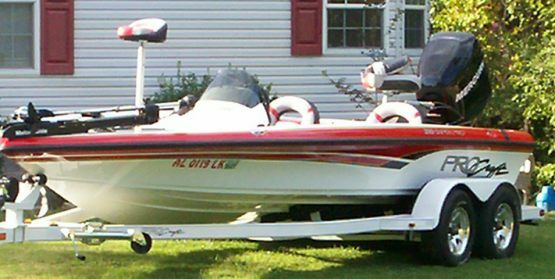 02 225 Merc Optimax 25 Tempest Plus, 10" Bob's hydraulic jackplate, Lowrance HDS5 w/Down Scan, LCX-15MT, Motorguide Digital 109#. 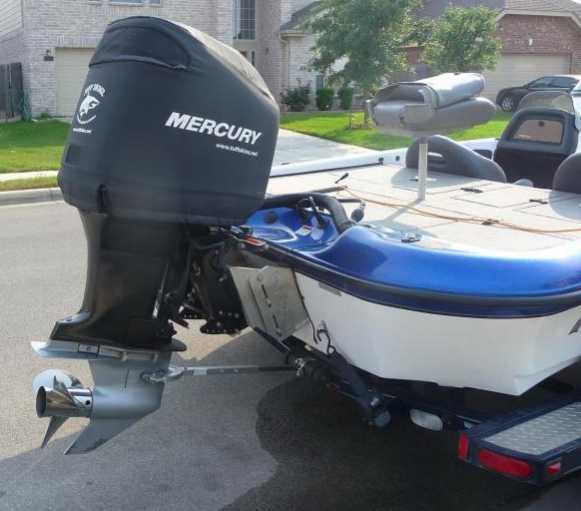 98 175 Merc 25 Tempest Plus, manual jackplate, MinnKota TM. 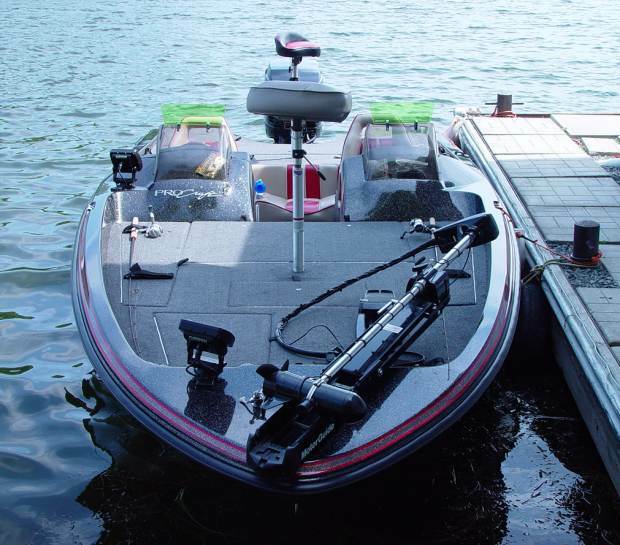 86 150 GT Johnson 19 OMC, Lowrance X98, X125, MinnKota PowerDrive. 87 115 Mariner 19 Ballistic, Humminbird electronics, Motorguide TM. 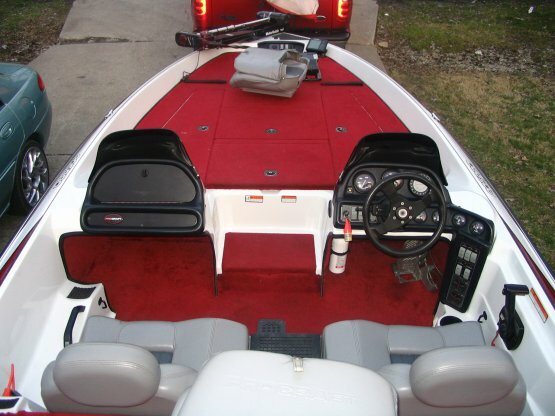 Updated 11/21/10.... 23 Tempest Plus, 5.5" Power Lite jackplate, MinnKota Maxxum 74#, Humminbird 581i, Evinrude TM. Propshaft is 3.5" below the pad. 55 mph @ 5800 rpm (gps). 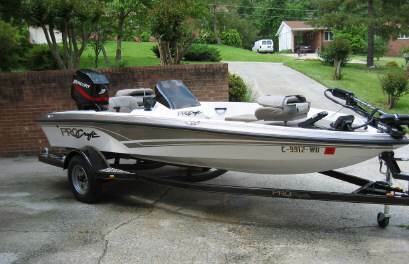 get it out on the water! Any advice is welcomed." 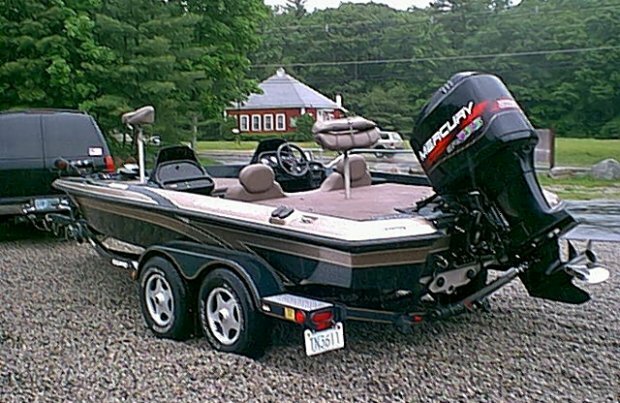 Super Pro Motorguide 62#. 59 mph @ 5500 rpm (gps). 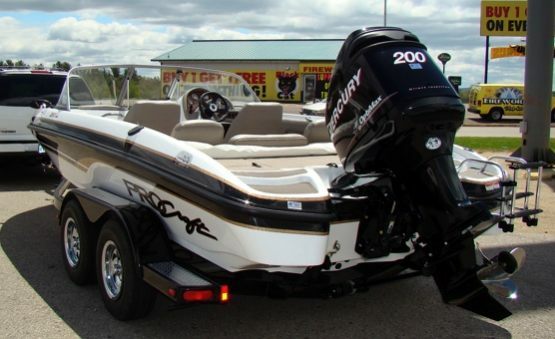 Super Pro Motorguide 70# Tour Pro. 73 mph (gps). 97 175 Mariner Motorguide Beast 72#. Motor is 4" above the transom. Updated 12/25/11....... 72 mph @ 5400 rpm (gps). "Added reeds and JSRE head." to ride on the back pad." 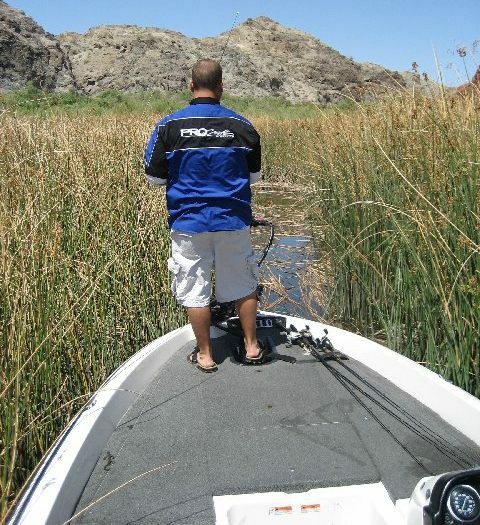 Dual Pro Motorguide 71# PinPoint. 60 mph (gps). handles well and the performance is everything I expected. 93 150 Merc Motorguide 71 HC. Propshaft is 2" below the pad. 03 225 Merc Motorguide 109#. Propshaft is 2" below the pad. 69 mph @ 5800 rpm (gps). 93 115 Merc 53 mph (speedo). 200 Super Pro 64 mph @ 5800 rpm (gps). tune up and carpet and some windshields." 94 150 Merc 58 mph (gps). 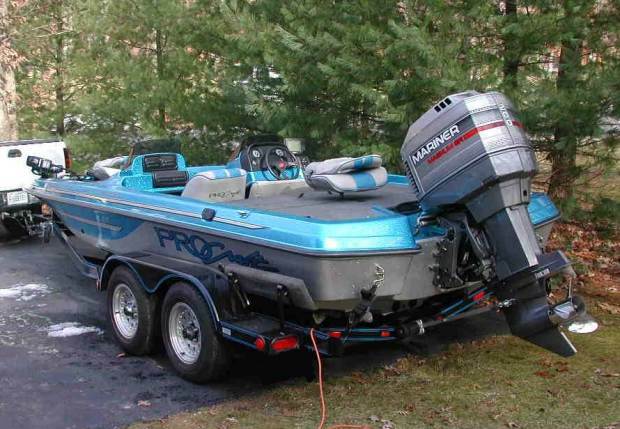 Super Pro MinnKota 80# Maxxum Pro. Propshaft is 2.5" below pad. height yet. It runs great now!" Pro DC Motorguide Great White 24V. Propshaft is 3" below the pad. however the more top end I can get the better." 95 115 Mariner 55 mph (speedo). 215 Combo (speedo). "I want to get more top end, any advice?" 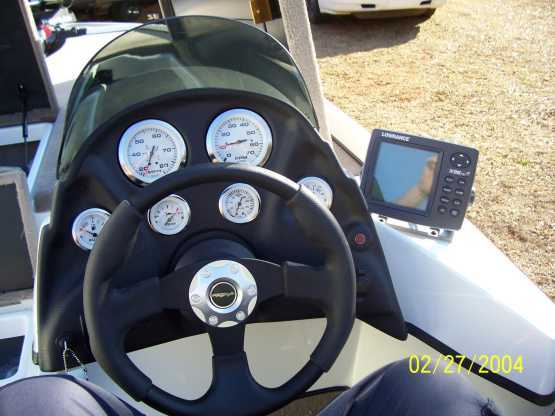 95 150 Merc Humminbird Wide View, Motorguide Pro Tour 82#. 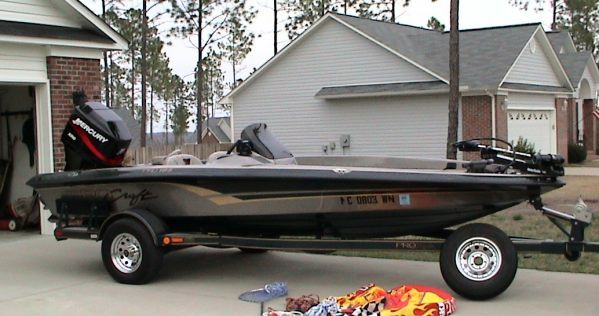 and it does everything I needed a boat to do." Super Pro Motorguide 56#. 67 mph (gps). 215 Combo LMS 489, MinnKota 101# Max Pro. 50 mph (gps). Pro 186 DC 65 mph @ 5250 rpm (speedo). Updated 10/22/08..... "Merc 250XB Pro w/cowl mod." newer 205 Pro. 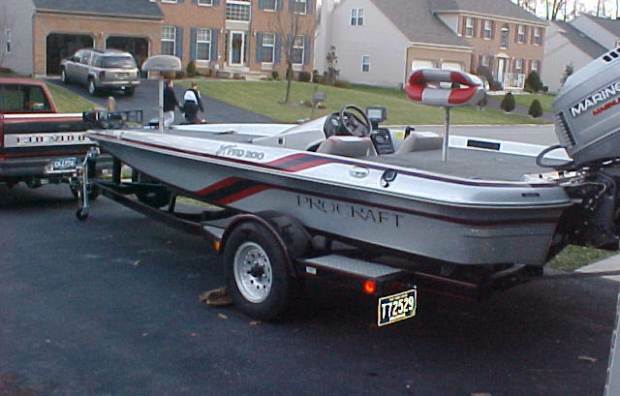 Going to sell this one and stay with Procraft." Optimax Optimax and love it so far. Great gas mileage plenty of storage. Super Pro DC Motorguide TM. 65 mph @ 5600 rpm (speedo). the smooth ride? 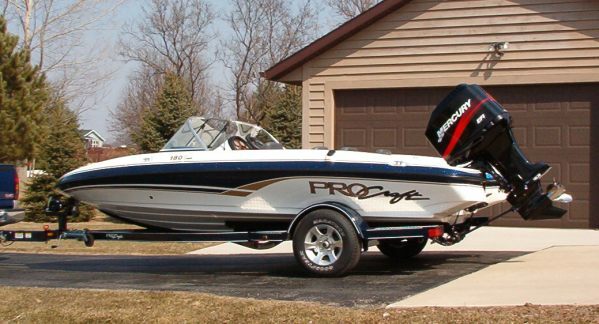 Eg: 882 Nitro is only 1450 lbs. should be looking to achieve....55, 58??? Pro 175 DC Motorguide 46#. 49 mph @ 5900 rpm (gps). 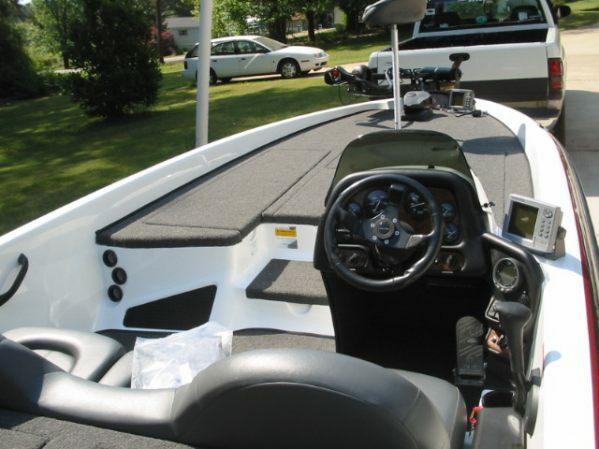 Super Pro front, Lowrance 520 console, Motorguide TM. top speed in no time." my Merc. Any help on squeezing a little more would be nice." Fish & Ski H20C, Motorguide 80#. Propshaft is 6" below the pad. 84 150 Merc 53 mph @ 5600 rpm (gps). 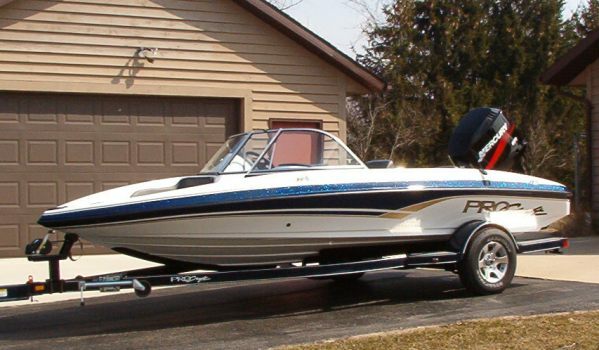 "I've owned the boat for 2 years. mph at wot. It's old but it's paid for and it serves its purpose." 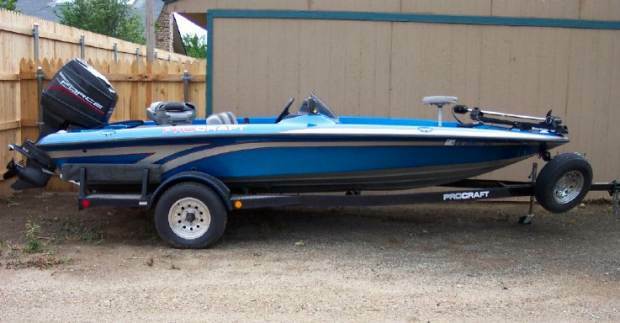 Super Pro 180 to me.If anyone has the same boat...send me an email!" Super Pro 210 72#. 70 mph @ 5600 rpm (gps). Super Pro LCX510, Motorguide TR82. Propshaft is 3.5" below pad. 64.5 mph @ 5600 rpm (gps). "Still trying props and setup." Dual Pro Motorguide Tour. 54.2 mph @ 4900 rpm (gps). 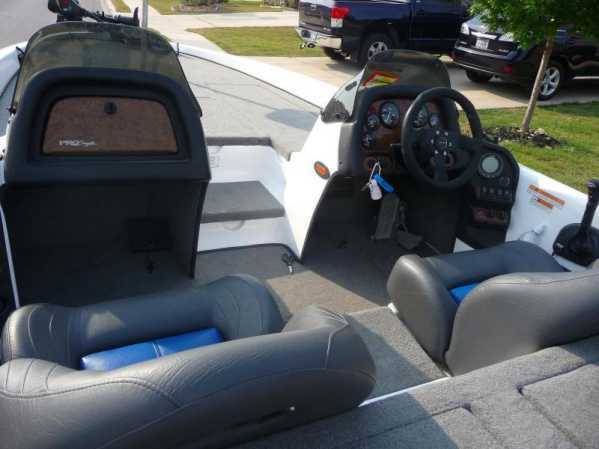 92 150 Merc XR6 "I'm trying to find the ideal height off the transom. 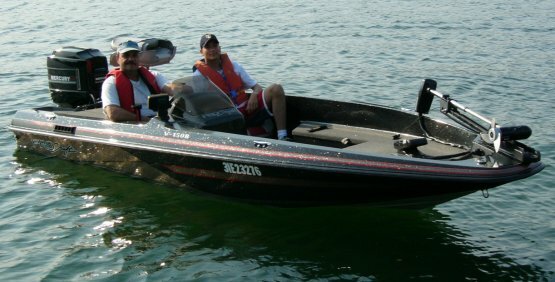 99 200 Merc Lowrance X65, Motorguide 750. 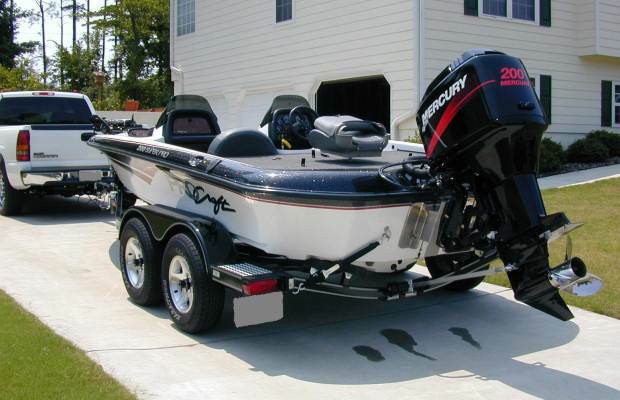 03 225 Merc Optimax with tons of storage." this thing I'll bet she just might run 68!!" Super Pro 72 mph (gps). Combo Motorguide 40#. Propshaft is 7" below the pad. out of. Plus, and best of all, she is paid for!" 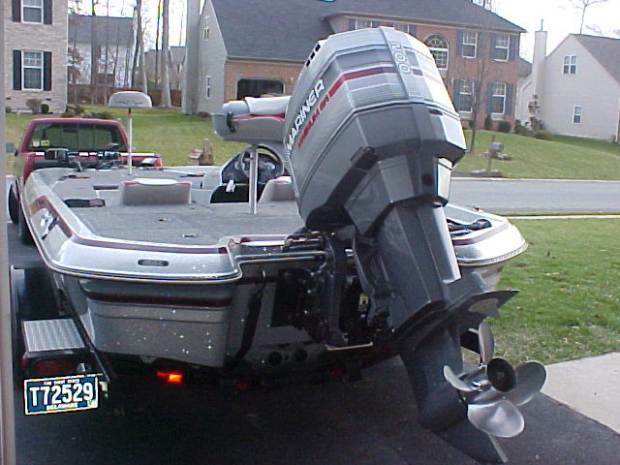 88 200 Yamaha MinnKota Power Drive V2 70#. 62 mph (gps). 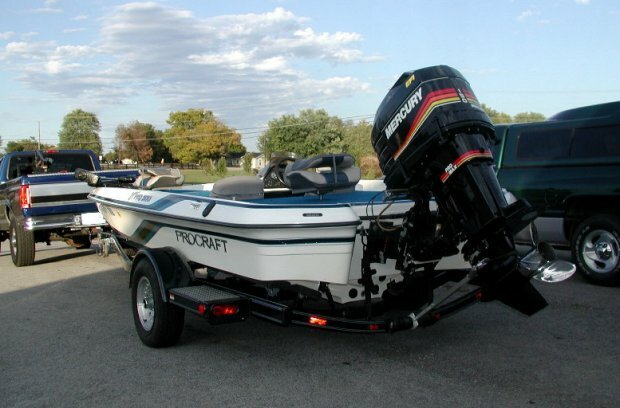 market, very happy with my Procraft, best boat for money. Super Pro 77 mph @ 6400 rpm (gps). 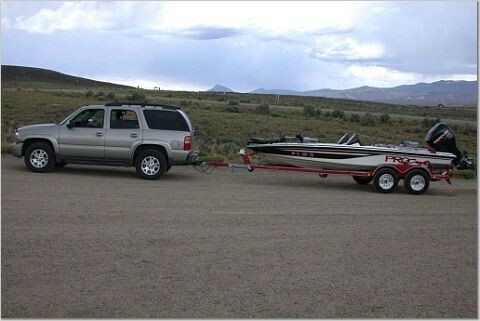 "I bought this boat 2 months ago. 07 200 Merc Optimax I love it. 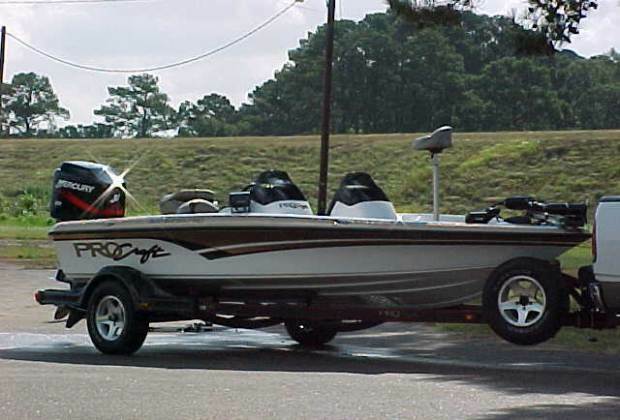 I had a 17.5' Stratos before and love the change!" 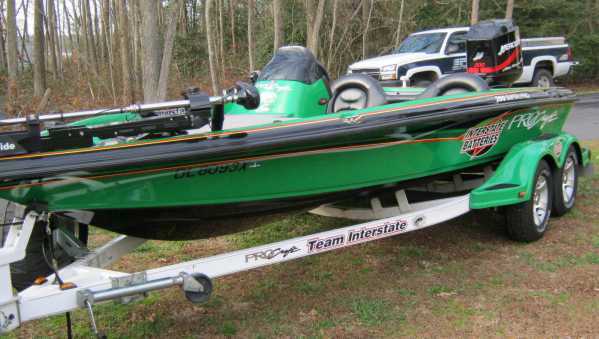 Piedmont NC blast off boat." 06 225 Merc XS Motorguide 82# Tour. Propshaft is 2.5" below the pad. 68.7 mph @ 5900 rpm (gps). "I am at end of break in. Handles good at this setup. Will need seat time to tell. I see the price of new ones." 06 200 Merc I love it. 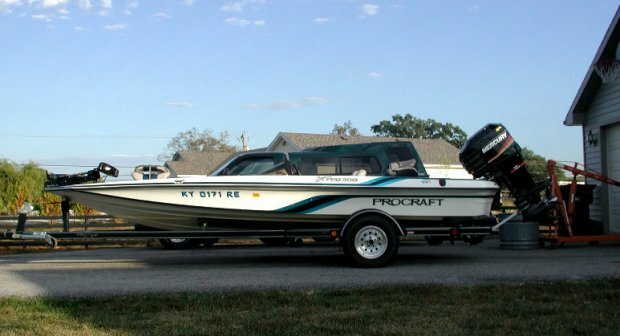 Lot of people talked down on the boats and I love it. on the back. 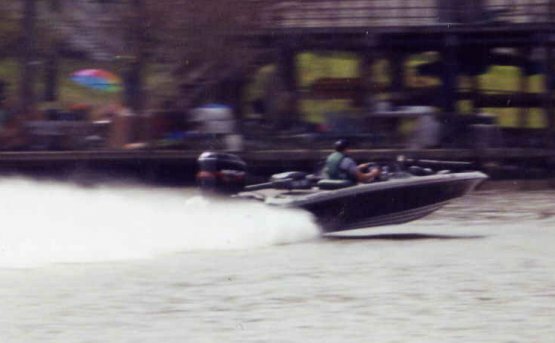 Tight lines......."
90 175 Yamaha 61 mph (speedo). 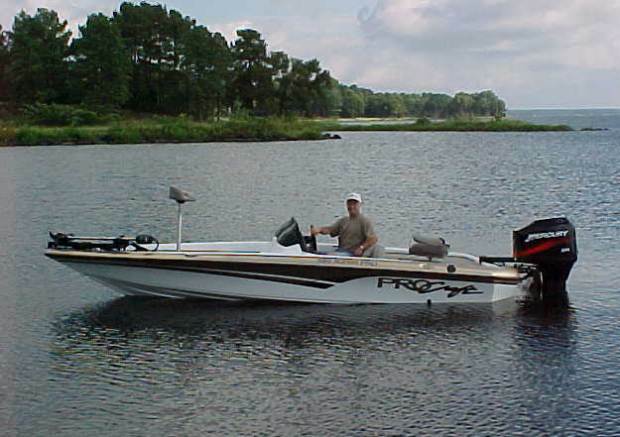 00 225 Merc EFI handle the rough water we get out on the Albemarle Sound." 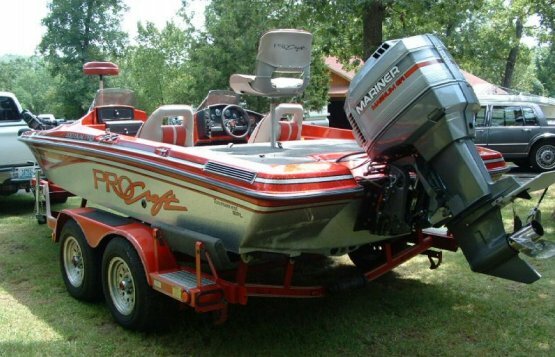 Super Pro SC Motorguide Tour 82#. 76.2 mph @ 5450 rpm (gps). 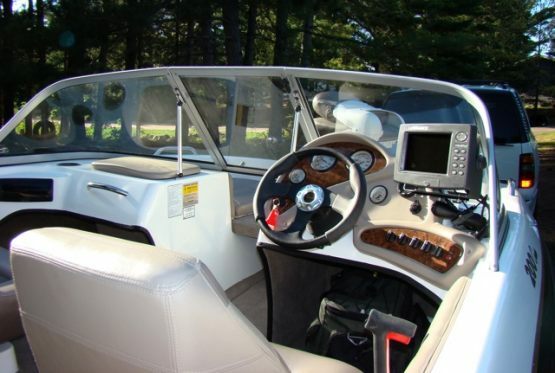 This boat is easy to drive and will fly for such a large hull. 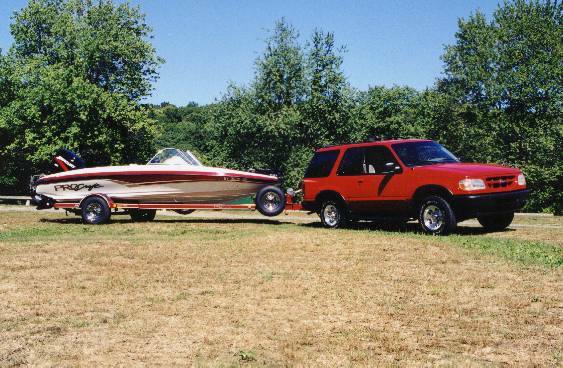 this rig: a minimum of 10" hydraulic plate and a 250 hp motor. the 250, it's worth the small difference in price." 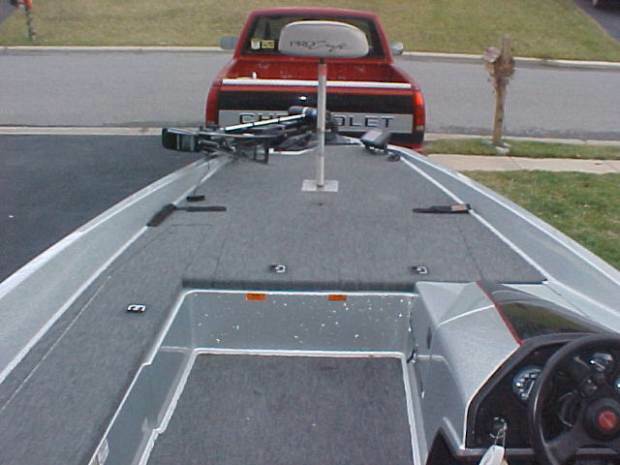 the fiberglass on the trailer. I haven't had any issues so far." Super Combo "I am looking for tips to improve the top end performance." same rig. Just can't figure out how. Would love info." 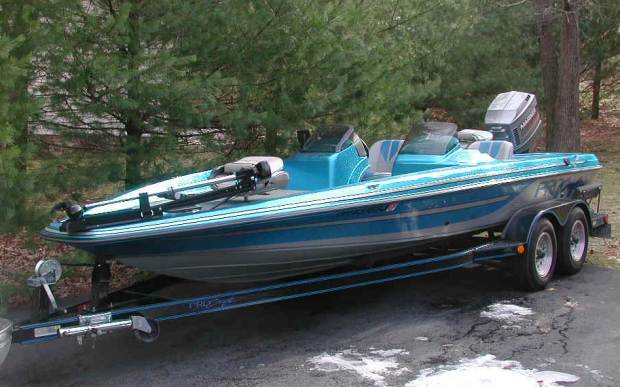 95 115 Merc boat, runs good but need tips to go faster." pad. 62 mph @ 5300 rpm (gps). 97 200 Mariner 71 mph @ 5900 rpm (speedo). 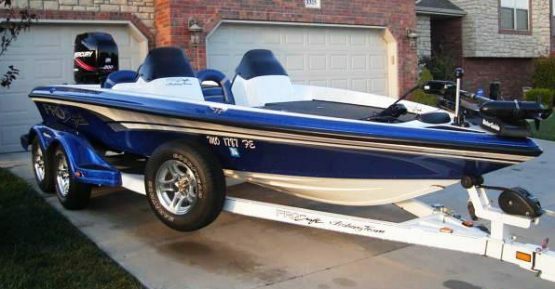 87 115 Yamaha setting for this boat? Any help or advice would be appreciated. Super Pro DC Elite 480 GPS, Motorguide 70#. Propshaft is 2.5" below pad. Boat Mart and fished that afternoon on Lake Guntersville. years. Thanks for all feedback." 05 150 Merc Optimax Lowrance 1440 indash, Motorguide Pro 70. 68 mph @ 5400 rpm (gps). "This thing mercs out real fast! 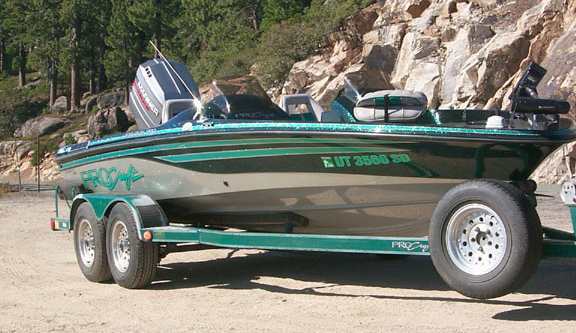 06 250 Merc Verado comments about the Verado 250." 04 200 Merc MinnKota Rip Tide 74#. Propshaft is 3.5" below the pad. set up issues for more top end. Sturdy, stable rough water ride. 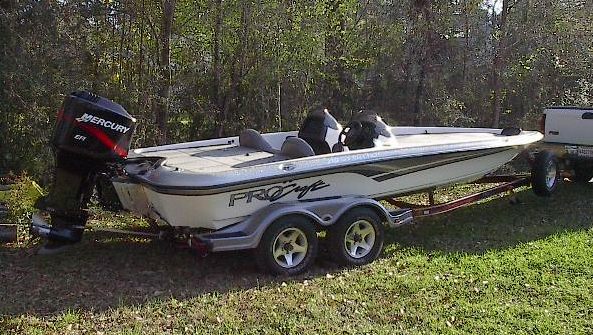 This boat is performing well for tournament fishing in Florida. aft end, water in the rod boxes sometimes, where is this from? yet. 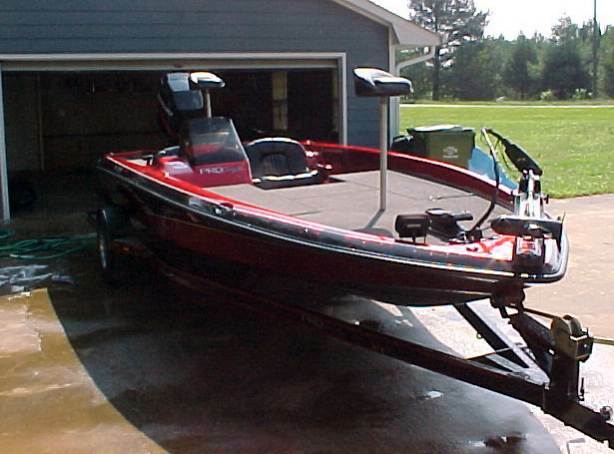 Overall is is a great boat and it is doing well for me. I would probably own another some day." 94 150 Mariner 65#. 58 mph (speedo). height yet, going to measure and update soon." Comp. MinnKota All Terrain. 51 mph @ 5100 rpm (gps). the pad. 64.4 mph @ 5600 rpm (gps). 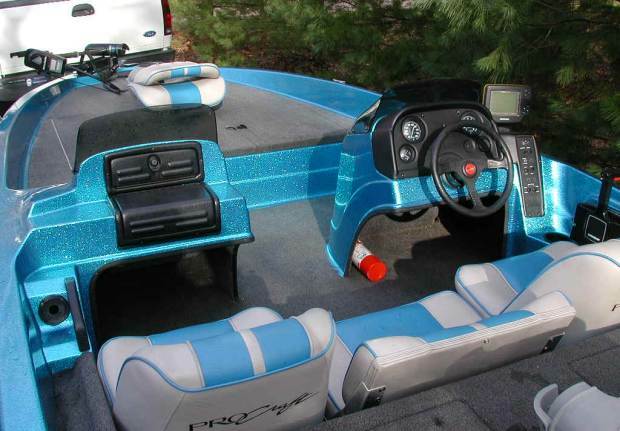 "I'm redoing this boat. the 150!! I'm still dialing it in but so far I've got 64.4 @ 5600.
of it, just need more time." 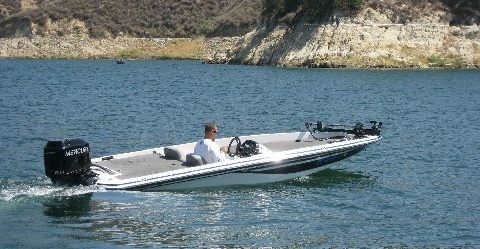 Super Pro Motorguide Great White TM. 65 mph @ 5400 rpm (gps). help please let me know. Thanks." for the combo? or any setup suggestions that you may have. I'm running around 3700' above sea level at Lake Powell. 95 200 Merc Propshaft is 5" below the pad. 73 mph @ 5800 rpm (speedo). 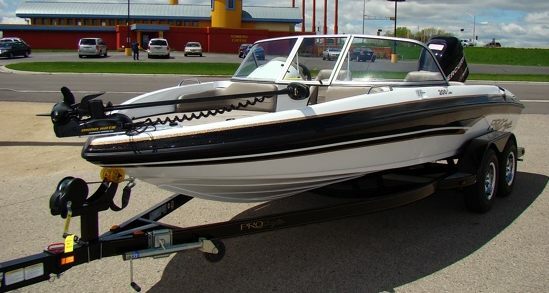 99 150 Merc Opti transom. 58 mph @ 5200 rpm (speedo). 00 150 Johnson Humminbird 3D, MinnKota Maxxum 74#. extension and recarpeted the decks/floor last winter." these conditions? Any thought? " Super Pro 200 Matrix 67 finder/GPS, ID 60 flasher, Motorguide TR82#. 04 125 Merc 53 mph. 81 115 Evinrude MinnKota 40#. 50 mph @ 4000 rpm (speedo). suggest anything to use to bring the shine back to the paint? get rid of cheap. Will send before and after pics when finished." 05 150 Merc XR6 M56S/Map, Motorguide Pro 6700. Propshaft is 4" below pad. 89 150 Johnson GT Mercury TM. 57 mph @ 5600 rpm (gps). 84 150 Merc 4x6, Motorguide TM. 52 mph @ 5350 rpm (speedo). suggestions and some input on adjusting the jackplate. 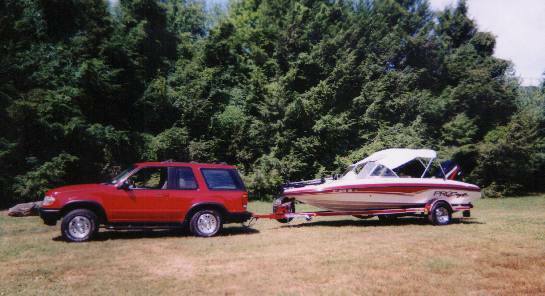 put the CMC on but haven't had the time to play with the boat. post my top speed once I borrow a GPS." Super Pro Motorguide TM. 72.2 mph @ 5850 rpm (gps). "Need a 27"
Updated 3/25/07...... should do 74 gps with 27 and maybe more setback." it has more in it. Need to work on hole shot, lot of slip." Super Pro 3000, Legend 2000, Motorguide 109# Digital. 98 135 Merc Opti Motorguide 7650. 53 mph @ 5500 rpm (gps). 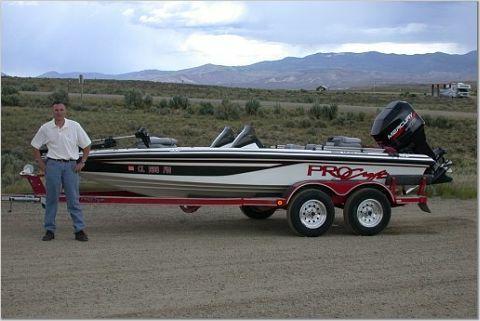 Super Pro Motorguide 67. 67.4 mph @ 5600 rpm (gps). Superpro 192 Garmin gps, MinnKota TM. Motor is 5" off the transom. try and reach that 70 mph mark." 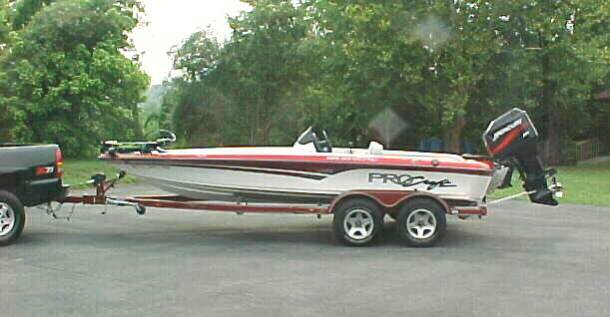 Pro Bass know if there is another prop that I can use to lower my rpms. someone suggest another prop that would lower my rpms? I was told maybe a 23" 4 blade?" functional air scoops. Synthetic premix and lower unit oil. for me. 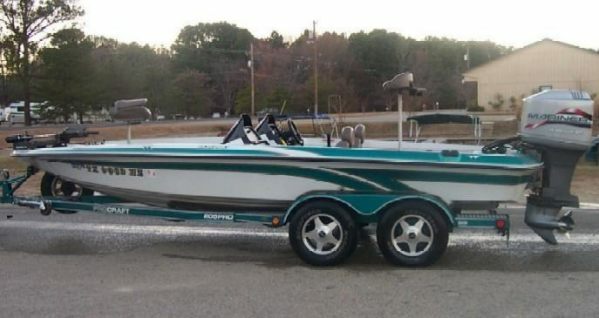 Best boat I've ever owned so far." Superpro 200 MinnKota Auto/Copilot. 71.3 mph @ 6100 rpm (gps). 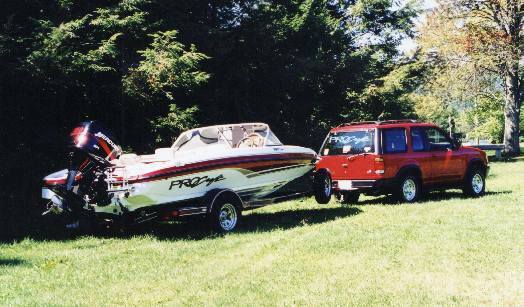 97 200 Mariner EFI "Love the boat....bought new in '97...single console. engine cowling by Gary Reed of Ft.Lauderdale...."
SP/DC flasher, Lowrance X71, Motorguide Pro 6700. 03 175 Merc EFI Propshaft is 3.5" below the pad. 68 mph @ 5881 rpm (gps). happy with the factory setup." Superpro DC MinnKota 74#. 71.96 mph @ 5800 rpm (gps). 26" prop. Will post results next week." 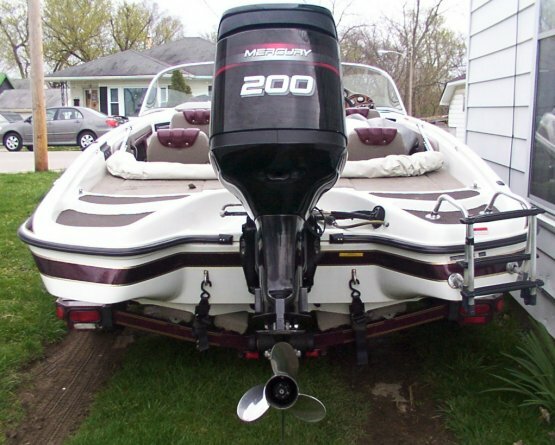 04 250 Merc Transom height is 25 1/2". 74.6 mph @ 5440 rpm (gps). 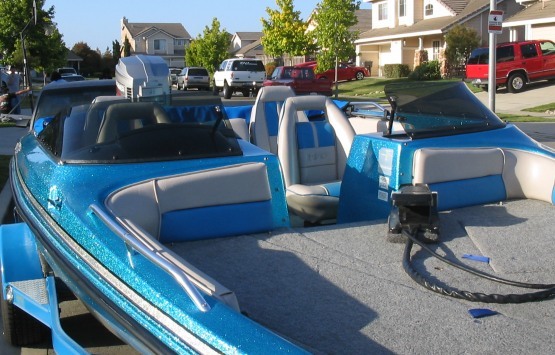 "This has got to be one of the worst boats I've ever owned. enough times that I have it." another motor had I known." 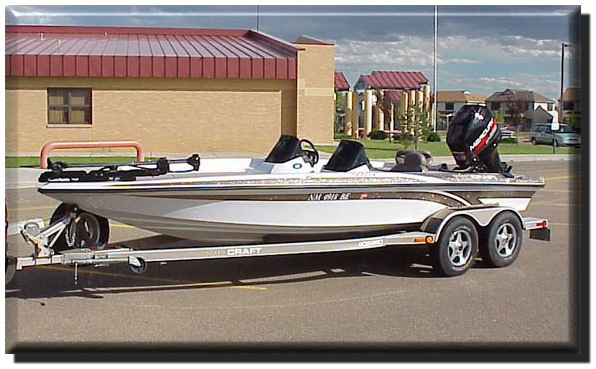 03 200 Merc EFI Tempest 2 24" = 65.32 gps, Laser II 25" = 68.86 gps. although the trailer lights are a bit flaky." 94 200 Mariner Erie and the 4-6 foot waves. Best boat bar none!!" 98 120 Force 52 mph @ 5000 rpm (speedo). 03 250 Merc XS Motorguide Tour 67#. Propshaft is 1" below pad. height and props. Seem to have it right on the money now. and maintenance beyond the usual (goods and bads). Thanks". 98 150 Merc Motorguide Brute 756. Motor is 2.5" off transom. plane. I would like to get a 23 Tempest and see what happens. it would run with one too. Otherwise, love the boat." 97 130 Johnson pad. 50 mph @ 5900 rpm (gps). 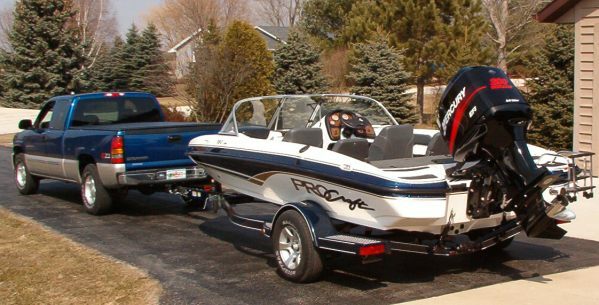 Super Pro 190 Motorguide 6700 TM. to my top end. Any comments would be appreciated." 03 150 Merc 67 mph (speedo). Super Pro hairline cracks in bottom of hull? 96 150 Merc Motorguide Brute TM. 65 mph @ 5400 rpm (speedo). have been in, great holeshot, turns like a sports car." 01 200 Merc MinnKota 74#. Propshaft is 1" below the pad. 73 mph @ 5750 rpm (gps). 180 Stalker Propshaft is 5.75" below pad. 59 mph @ 5200 rpm (gps). me a lot, Kick A$$ site, keep it up!" 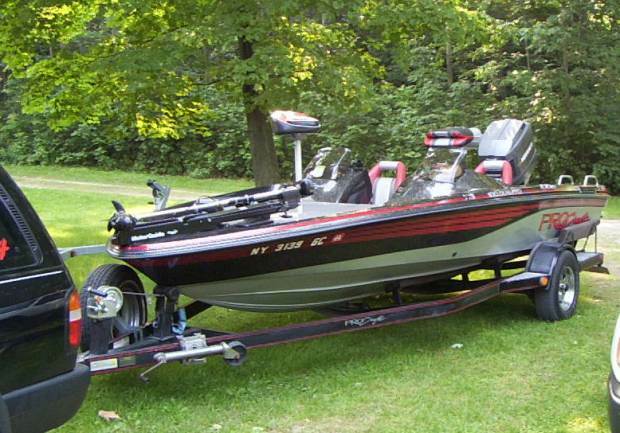 Fish/Ski Motorguide 55# TM. 58 mph @ 6000 rpm (gps). 01 225 Merc Motorguide TM. 75 mph @ 6000 rpm (gps). 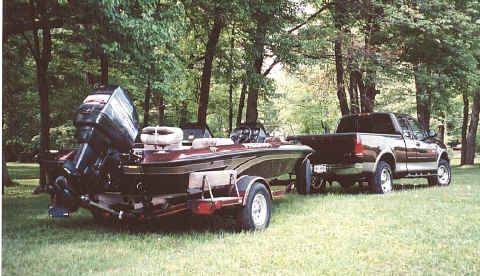 tilt wheel, 3 bank charger, custom trailer with cover, Hamby's. owned. Hopefully this rig will provide the same satisfaction." 98 225 Mariner 73 mph @ 5350 rpm (gps). 03 150 Merc breaking in. I need to figure out prop height." SuperPro 210DC electronics, Motorguide Tournament Model. 01 225 Merc 65 mph (gps). 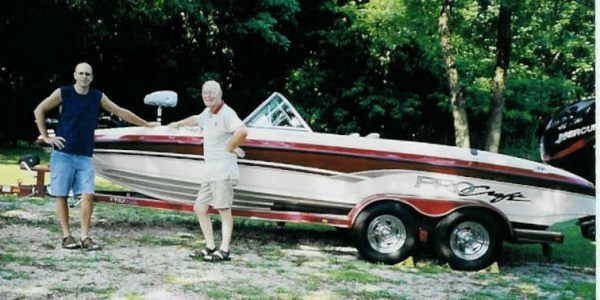 "This is by far one of the finest boats made." pad. I can run WOT and the backend wants to kick out. 88 150 Johnson OMC 58# TM. Propshaft is 2" below the pad. 96 175 Merc EFI Propshaft is 2" below the pad. 71.3 mph @ 5950 rpm (gps). 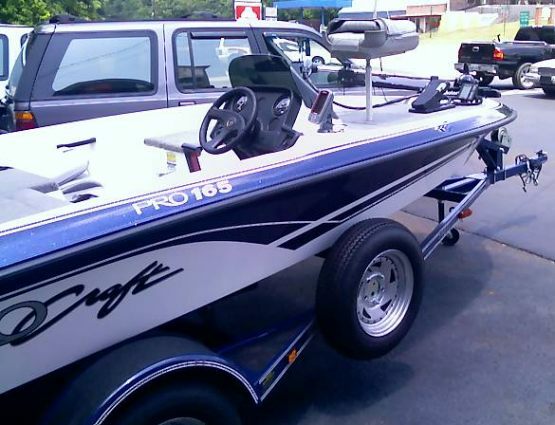 "Being that this is my first boat, I am extremely happy with it. The 71.3 was GPS but I think I have a little more left in it. much. Everything is stock, with no rework on the motor. 04 175 Merc Motorguide Pro Guide 67#. Propshaft is 1.5" above the pad. Optimax 68/74 mph @ 5500 rpm (speedo). 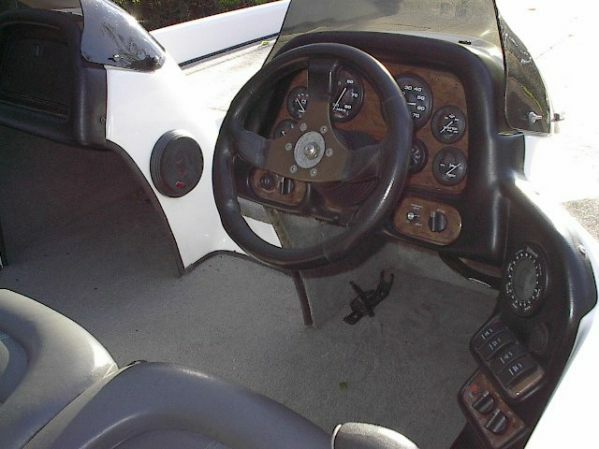 97 225 Merc EFI Motorguide Tm. 68 mph @ 5800 rpm (gps). but so far I love it." for the month of June 2002 for "Hot Rigs of the Month". I wouldn't change a thing." 00 225 Merc EFI (speedo). 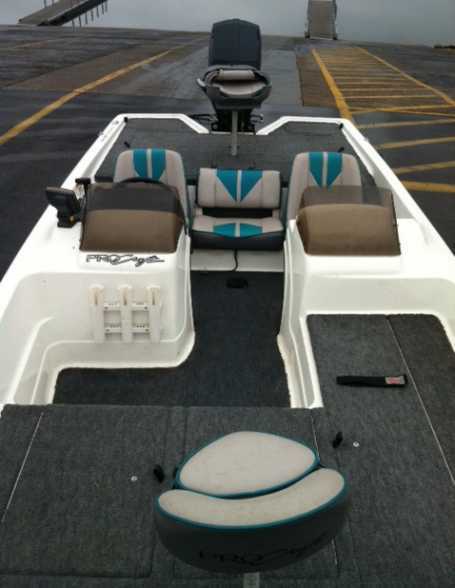 215 Combo Humminbird Legend 40, Motorguide TM. 02 225 Merc EFI 65 mph @ 5700 rpm (speedo). of guts and winds out nice. Fishing, water play are excellent. and is already being replaced and modified to be stronger. H5, just want to play around." 01 200 Merc Merc. 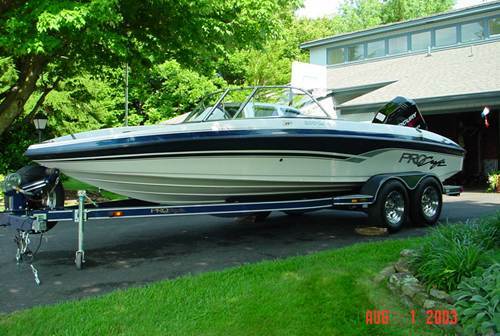 Overall the boat runs great and takes the waves well. Merc has a "clogged tube" but I can't seem to get the dirt out. problem as well. Mike V "
or other suggestions would really help." 03 200 Merc pleased with it but I have encountered 2 problems. when this happened. Other than that the boat runs great. and I wouldn't have any other." 04 225 Merc "Just broke it in. I'll have numbers in a couple weeks." the pad. 66 mph @ 6400 rpm (gps). 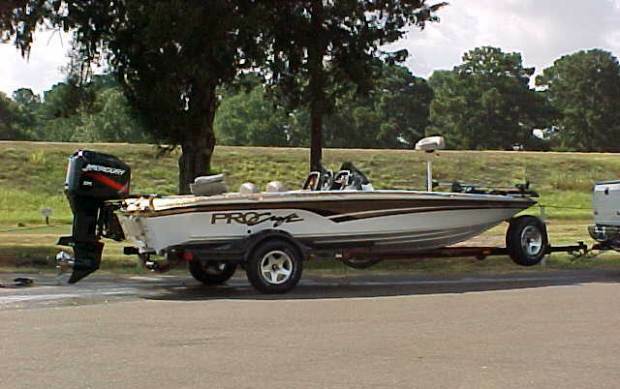 "Bob's tuner, low water pickup. 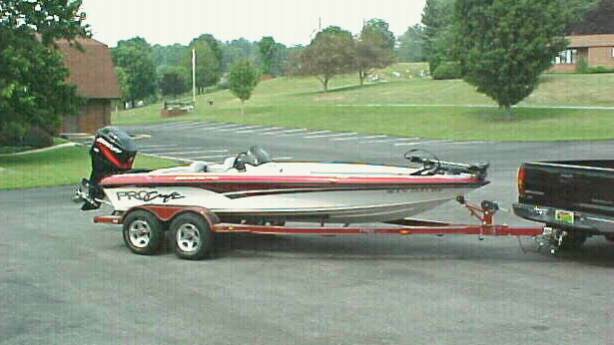 Quick boat for weight." 180 Combo SE Propshaft is 3.5" below the pad. 59 mph (speedo). 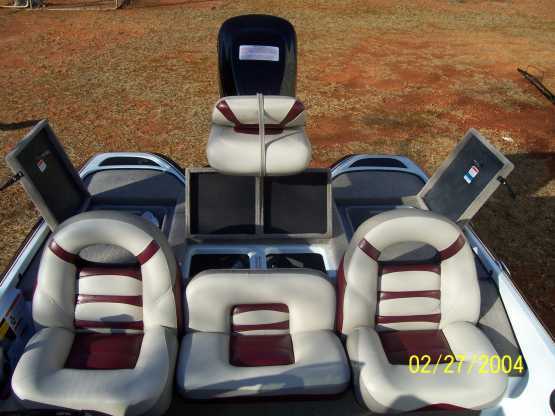 Dual Console 1250 w/Sidefinder, Motorguide Pro 6700. 00 115 Merc 55 to 57 mph @ 5100 to 5200 rpm (speedo). raise the motor on the port side would be nice." 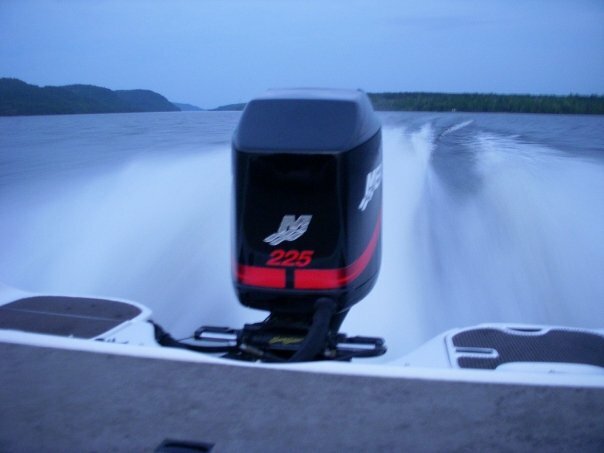 205 Dual Pro Motorguide 757. 77 mph @ 5900 rpm (gps). limited to 35 mph so I can't really open her up anymore." 83 115 Merc 51 mph @ 5000 rpm (gps). "I am looking for someone that can help me with my setup. jackplate or not. Any help is appreciated." Combo Garmin GPS Map 76S, Motorguide 76 Pro. 03 225 Merc Propshaft is 3" below the pad. more info later after break-in." gone). It came with a Laser II prop (it's now a spare). that it had some scratches and was in need of new carpet. my setup results later this month. Super Pro MotorGuide 6300. 64 mph @ 5500/5600 rpm . Super Pro 190 Zercom ZF40, Motorguide Tour 71#. Propshaft is 2.5"
03 150XR6 Merc below the pad. 66 mph @ 5550 rpm (gps). "So far I love the rig. Have not been on rough water yet. This weekend will give here a real workout." straight one out of 5 tries." 74 mph @ 5800 rpm (gps). 03 150 Merc XR6 pad. 67 mph @ 5500 rpm (speedo). 01 250XB Merc Motorguide Tour Edition 107#. 82 mph @ 6200 rpm (gps). (gps with light load) around 79-80 tournament loaded. current. 3700 Plano system in back compartments. 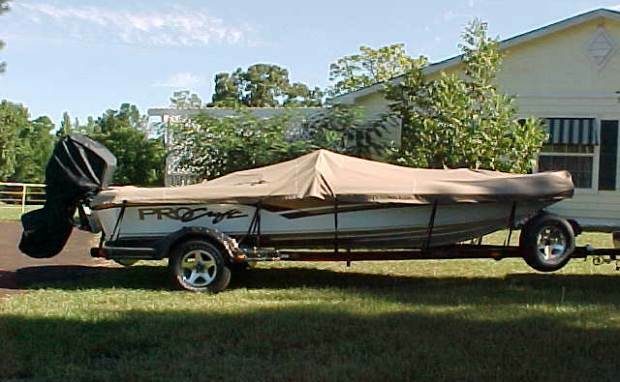 bought the 2003 SuperPro with the 250XS Opti. Can't wait to see that baby run." 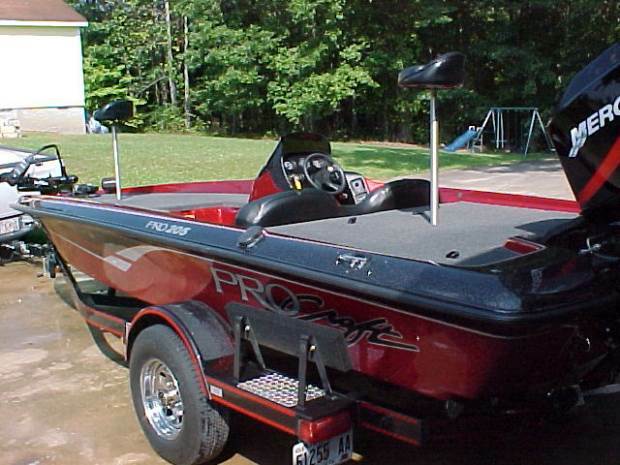 Super Pro Lowrance X87, MinnKota Maxxum 74#. 03 150 Merc XR6 65 mph @ 5400 rpm (gps). "Still in break-in stage." 03 200 Merc Motorguide Pro 67. Propshaft is 3" below the pad. more (too cold for this OLD boy)." 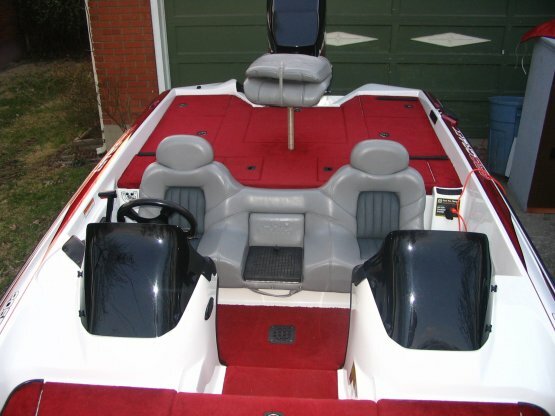 Superpro 200 Motorguide 67# TM. 73 mph @ 5700 rpm (gps). white film on the fiberglass?" 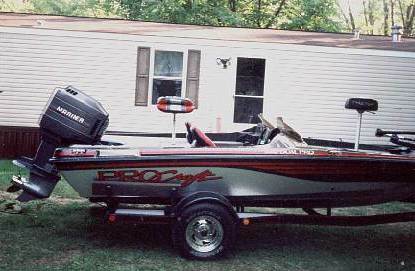 Astro or Procraft 200DCX and this boat fits the fill. I will try to update the photos when the weather is better. 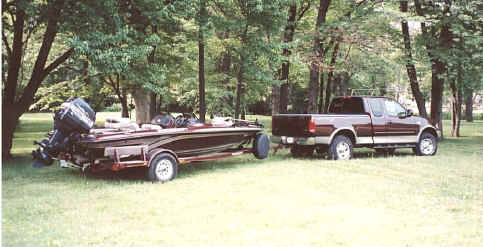 pics so they'll know how a 1994 V-200DC is laid out." I've got Garmin and Lowrance electronics with water temp. 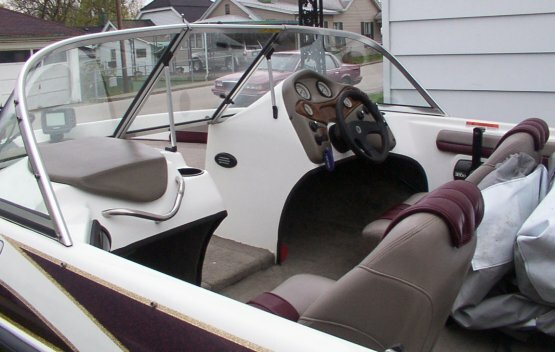 steering, custom cover, keel protector, all under $27,000. touches. 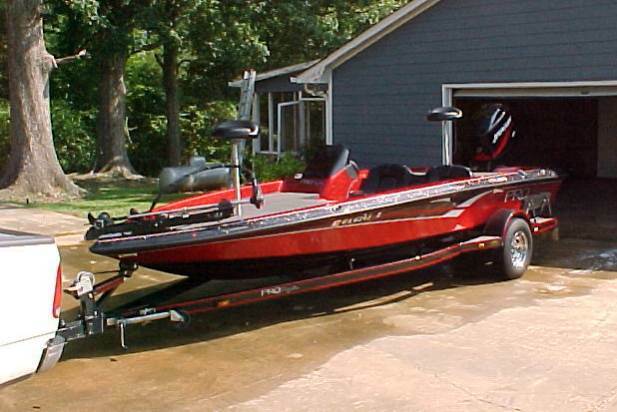 Lots of storage spaces & Plano 3700 storage. layout from what I've been used to in a single console. and that makes the inconvenience all ok.
rig at an affordable price." 150 Mariner 62 mph @ 6000 rpm (gps). 225 Merc EFI 72 mph @ 5800 rpm (gps). 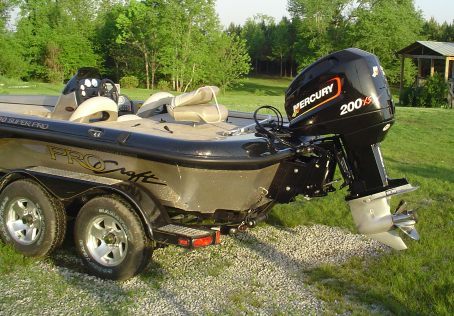 200 Merc Optimax MotorGuide 107# TM. 71 mph @ 5850 rpm (gps). a 150 though, considering dry hull weight is 1760 lbs. to have 5500 rpms and gain speed. I'll update at that point. 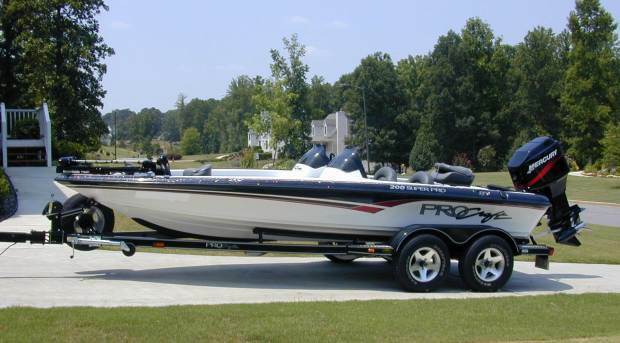 Pro200 MotorGuide 757 TM. 4" below the pad. 01 200 Merc Optimax 76.5 mph @ 5500 rpm (gps). 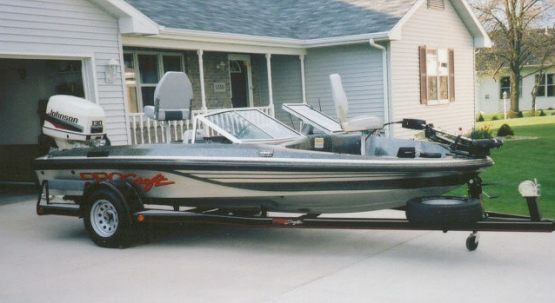 200 Mariner EFI MotorGuide 756 TM. Propshaft is 2.5" below the pad. 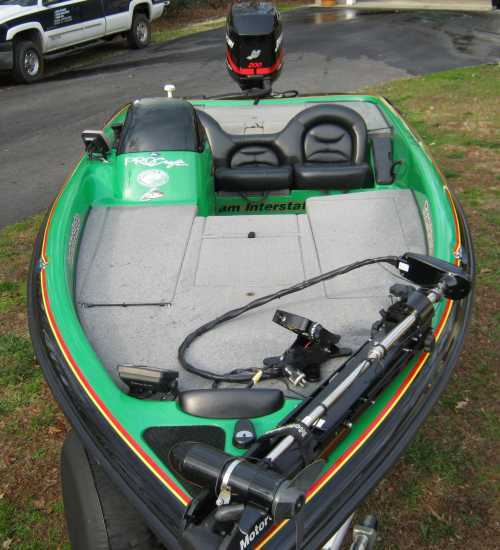 Superpro Eagle Ultra Classic, MotorGuide XP 6000.
haven't adjusted the jackplate yet." Combo Propshaft is 4" below the pad. 43 mph @ 4800 rpm (gps). to a 3 blade aluminum I lose 200 rpm but no any speed. Combo 67 mph @ 5800 rpm (gps). otherwise it blows everything else away." SuperPro Lowrance X85, MotorGuide Tour 107# TM. Updated 6/11/02...... 74 mph @ 5200 rpm (gps). 150 Merc XR6 happens, then possibly a 23 Tempest if all goes well !!" 225 Merc (gps). 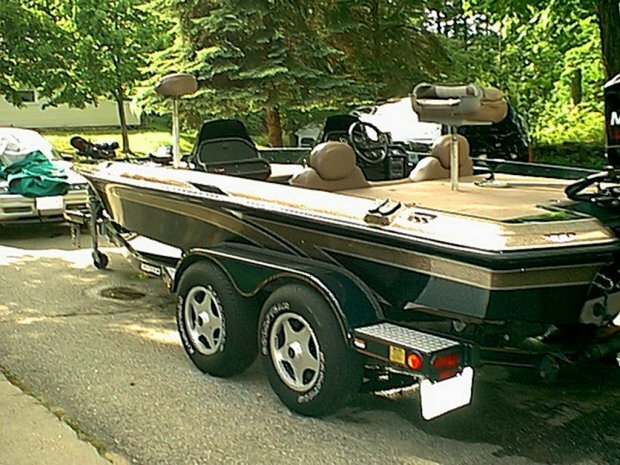 "Just love this boat. It runs and fishes great." 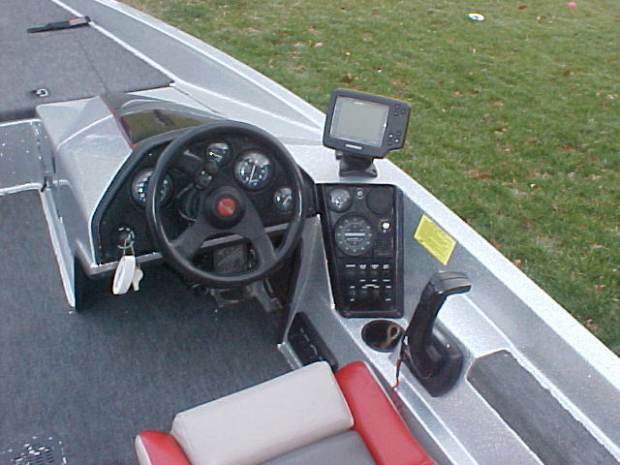 Procaster 180 MotorGuide TM. Propshaft is 4" below the pad. 150 Merc 74 mph @ 5800 rpm (speedo). 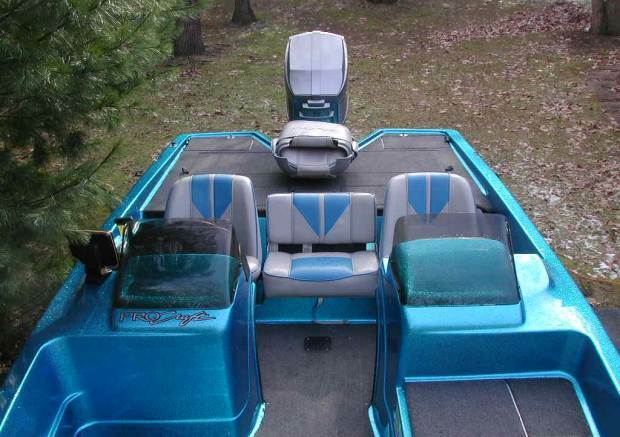 "With no load and little gas this boat will scream for a 150! well for a '91 model." 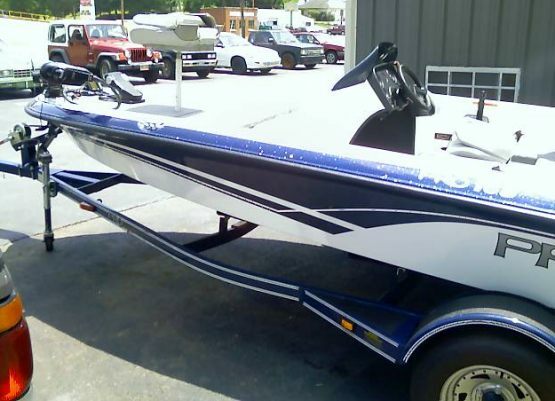 150 Merc XR6 "Great boat for the price. Handles rough water well. the 150EFI. The 150 XR6 gobbles gas...."
180 F/S Combo 51 mph @ 5700 rpm (gps). Updated 2/19/02 set this up for top performance. Any tips would helpful." Super Pro 67# PT. 74 mph @ 5400 rpm (gps). bass boats but this boat exceeded all my expectations. of water traffic you understand what I'm talking about. because their boats could not handle the rough water. 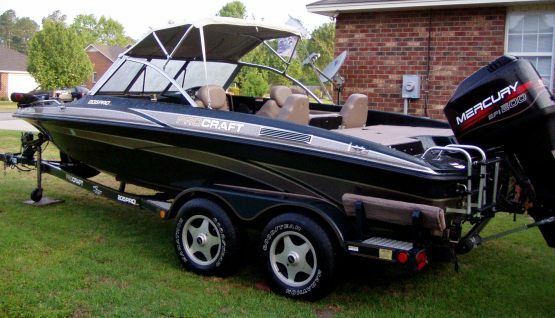 boat will be a PROCRAFT ALSO!" 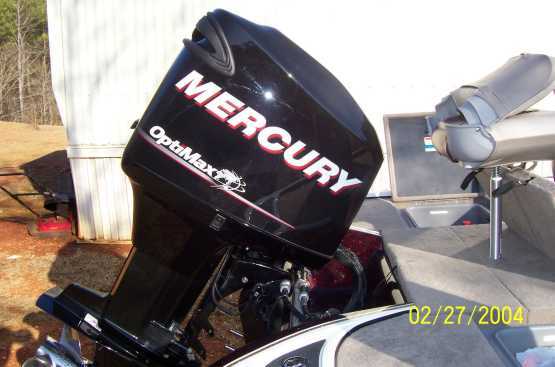 200 Merc EFI Motor is 5 1/2" off transom. 70-72 mph @ 5800 rpm. on it. Had a 150 XR6, but was slow and underpowered. repair. Any ideas or suggestions would be appreciated. 100 Merc Panorama, Minnkota 50# TM. Motor is 2.25" off the transom. 54.8 mph @ 5300 rpm. plane. Cut foil in half, moved closer to transom. 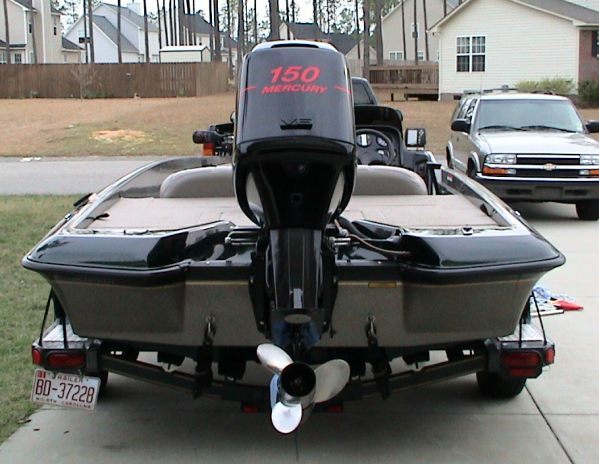 This makes boat faster, quieter and more stable. 02 150 Merc XR6 MotorGuide XP600 67# TM. 63.7 mph @ 5200 rpm (speedo). catalog. Have had it for 5 months now and I LOVE it. 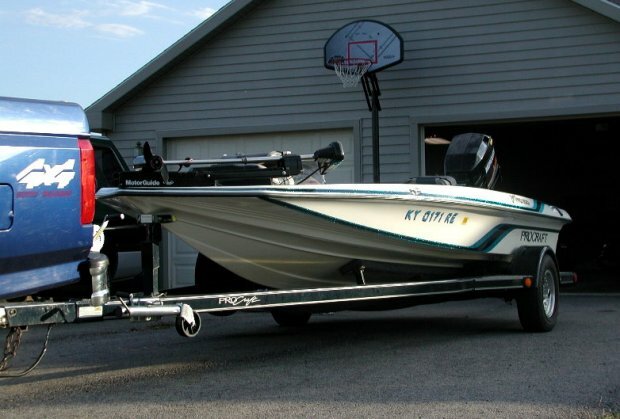 Handles rough water exceptionally well for an 18.5' boat. 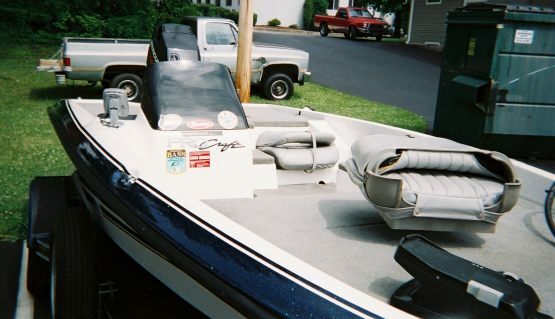 to any one out there considering purchasing a new boat." 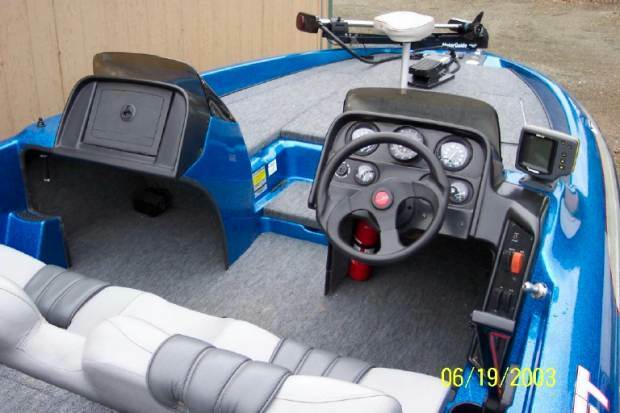 150 Merc XR6 Humminbird ID60 indash, MotorGuide 750 - 50# TM. 150 Merc 567 TM. 62 mph @ 5100 rpm. SuperPro200 Lowrance LMS 350A, Garmin 240, MotorGuide TM. 150 Merc MotorGuide Tour Ed. 54 mph @ 5500 rpm (gps). pitch? Would a 24" Trophy help?" wish it had a built in cooler." Pro 185 DC MotorGuide Brute 756 12/24 TM. 150 Merc XR6 66 mph @ 5400 rpm (speedo). 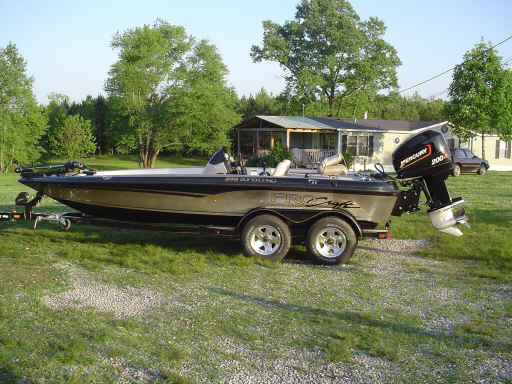 "Love the boat. Great storage. Plenty of room." 90 Mariner 50 mph @ 5600 rpm (speedo). 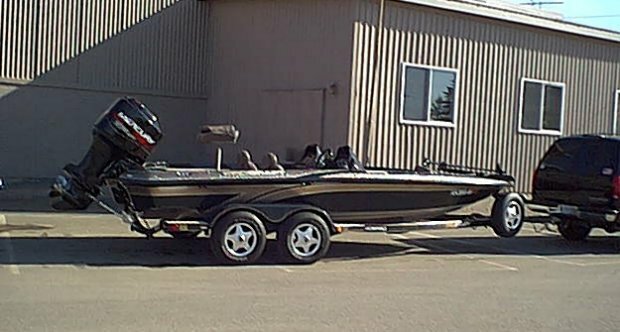 "New boat. So far so good." SuperPro Zercom indash flasher, MotorGuide TM. running but at WOT it will drink the gas and oil." ProDC w/gatormount. 70 mph @ 5600 rpms. (speedo). 150 Merc XR6 MotorGuide 756 Brute. Motor is 2" off the transom, 2"
below the pad. 59.8 mph @ 5200 rpm (gps). "Great value! 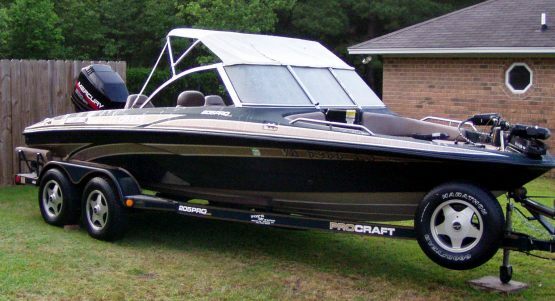 Love the boat and the price." 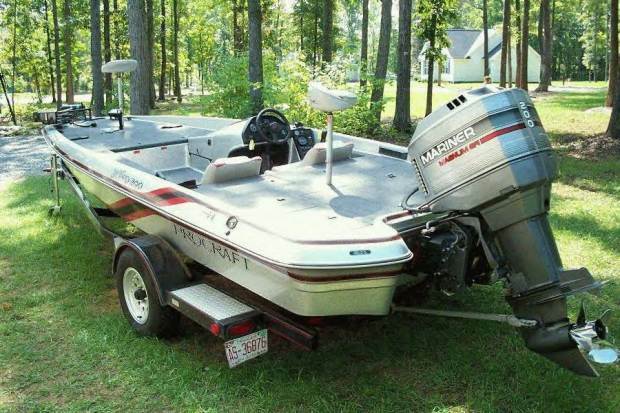 150 Mariner Minnkota 74# Maxxum. Motor is 5" off the transom. 59 mph @ 5600 rpm (gps). "Plenty of room, Love it. drilled the case and opened the cowling at the louvres. Wow, what a holeshot! " 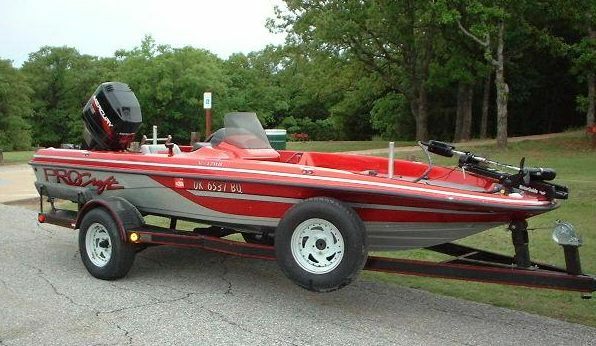 200 Merc EFI MotorGuide Brute TM. 70 mph @ 5600 rpm (speedo). MotorGuide 55# TM. 72.6 mph @ 6100 rpm (gps). Updated 3/2........... "Boat is up, out, and moving. Finally got it fine tuned. Wouldn't trade it for anything." room. 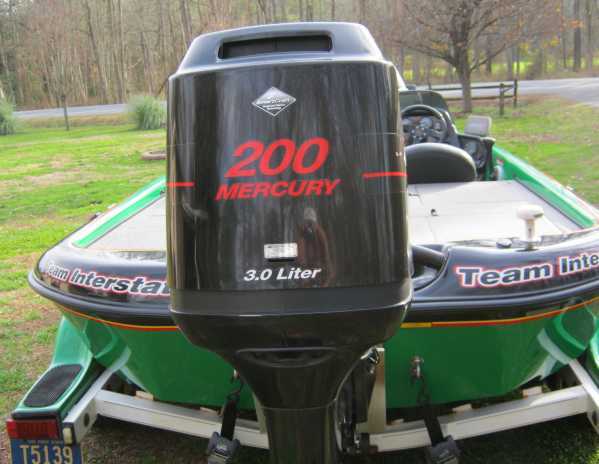 You can't go wrong with the Mercury Optimax. The gas mileage is awesome and they run very strong. 00 200 Merc flasher, MotorGuide 52#TM. 8" Rite Hite jackplate. 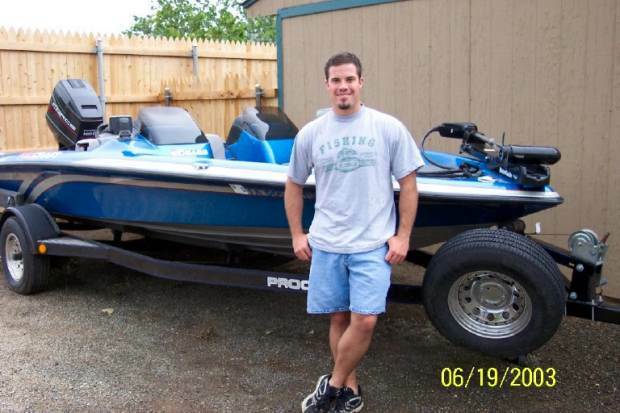 Update 10/21/04........ Motor is 3.5" off the transom. 65 mph (gps). 125 Merc (speedo). 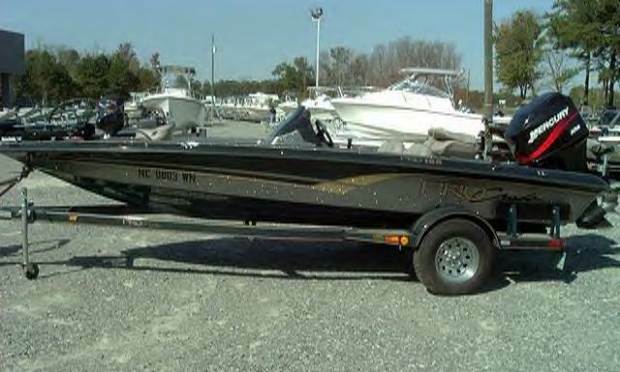 "Great in rough water for a 17+ footer!" Dual Pro flashers, MotorGuide 62# TM. 6" RapidJack jackplate. 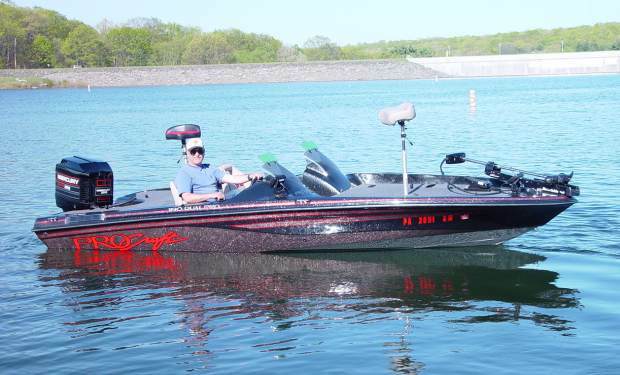 Tournament Special 67.3 mph @ 6100 rpm (gps). Updated 12/4 and dry in the rough stuff." 115 Merc 57 mph @ 5300 rpm (gps). 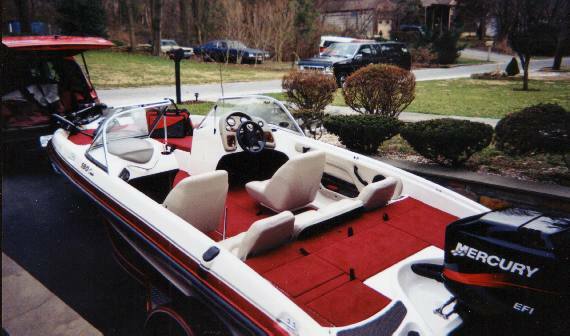 150 Mariner MagII transom. 63 mph @ 5400 rpm (gps). appreciate any tips anyone might have." 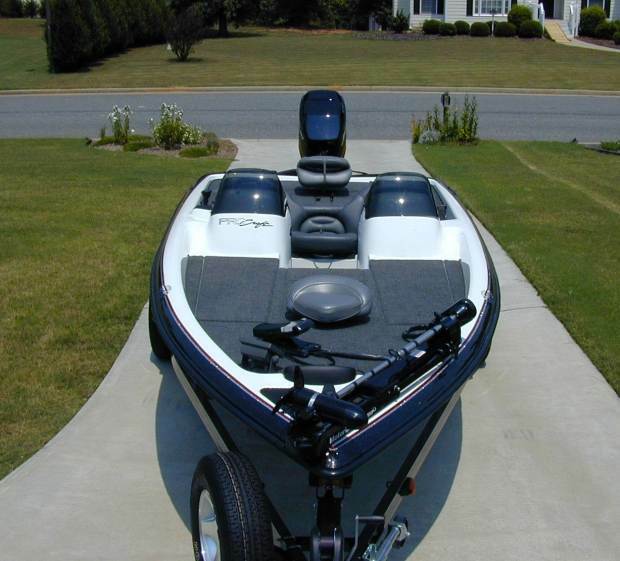 150 Merc BlackMax Evinrude 12/24 TM. 60 mph @ 5800 rpm (speedo). charger. 43 mph @ 5500 speedo. 150 Mariner MagIII X70A 3D, X55A, MotorGuide F67#, propshaft 2 /2"
below pad. 61 mph @5250. "Gotta go faster!" 66.2 mph (gps) @ 5800. Prop reworked by Rich Boger. glad to answer any questions. My Procraft is set 1 1/5"
Rich Boger. Top speed is 68.3 mph gps at 5800 rpm. 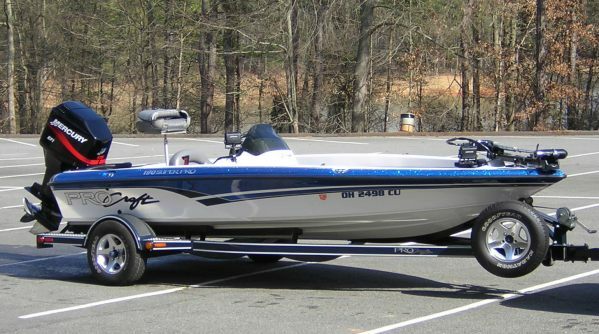 mph, which is .5 seconds better than my Bogerized 24"
04 150 Merc Opti Network Fishing A Joke, Pinpoint 3700.
myself, also changed the gauges to Smartcraft stuff, WOW!! How very neat they are. New motor is very stingy on fuel. recommend anybody going to. The TM with their display? That's fine, but forget the "network" stuff." 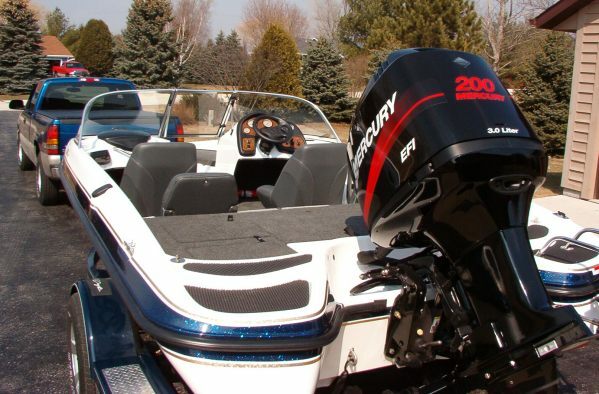 200 Merc EFI Lowrance X55A and X70A. 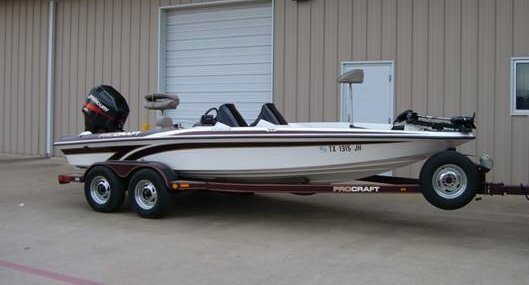 Copyright © 2000-2017 BassBoat Central Inc. All rights reserved.